Call us or email for all other rates and service. 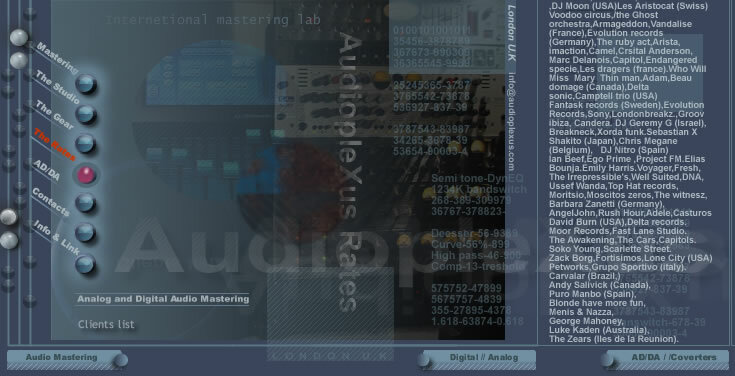 AudiopleXus is a hardware mastering studio and a DAW not like many other mastering studio only composed of a computer and a few software and studio like those you can do it at home. While other mastering studios can charge a fortune, with results not always up to expectations, our clients tell us that our results match or exeed in quality those from the most established studios and as a result the mastering side has steadily grown through word of mouth. WE deliver within 48 hours anywhere in the world. Audioplexus Mastering studio as been open only fore two year with the best mastering tools available for today music industry. Call us for your free trial. AudiopleXus also do restoration - declicking, denoising, dehissing. Record to CD and any format tranfer. State of the art mastering studio London-+44(0)20-8980-8947-Photo by Owen Davies-Design By AudiopleXus - info@audioplexus.com-Navcool group Plc © ® TM All Right Reserved 2004 2012. CD and audio mastering studio. CD mastering studio for audio music and sound in London UK.